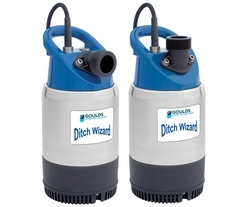 Goulds Pumps 2DW Ditch Wizard Series Dewatering pumps are intended to be used for pumping water which may contain abrasive particles. The pumped liquid may contain particles up to a size which corresponds to the openings in the strainer. Specifically designed to remove water from Drainage ditches, Trenches, Basements, Manholes and Excavating drainage in the building trades.